The north of Suffolk has several villages that can't decide whether or not they want to be towns. Walsham-le-Willows is one; nearby are Rickinghall, Botesdale and Stanton. So often in the east of the county, you cycle for miles through parish after parish, the village centres fleeting and ephemeral. You are more conscious of the pattern beneath the plough. Up here, villages are substantial; they have shops and pubs, schools and factories. To all intents and purposes, the village is the parish. In Walsham, they make furniture. I liked that, and wondered if the church would have anything locally made - this is the charm of some Suffolk churches, where village craftspeople have contributed their work over the centuries, at Mendlesham and Eyke for example. The church sits in a huge graveyard at a junction, you couldn't possibly miss it, or think of anything else as being the heart of the village. Longways to the street, St Mary looks like a great ship. Barmy old Arthur Mee called the exterior 'full of dignity', and that is about right. Few Suffolk clerestories are more impressive, with flushwork picked out between the windows. The size of the church is probably, as Mortlock explains, because it was gifted to Ixworth Priory, who rebuilt it at the same time, and in pretty much the same style, as Ixworth. The porch is dated internally at 1541, a fascinating moment in the fever of the Reformation. Part of the harmony of the design is that it is focused on the north side rather than the south, attuned to the village it serves. St Mary has been through a difficult recent period during which this well-known and loved church was kept locked. This is unusual enough in Suffolk, but for such an important church to be inaccessible was most unfortunate. Today, however, St Mary is open, and once again the beating heart of its community. As you might expect, the interior was lavishly restored by the Victorians, and would not be out of place in a town church in Norwich or Ipswich, but it was a happy restoration, because much that is medieval has survived. 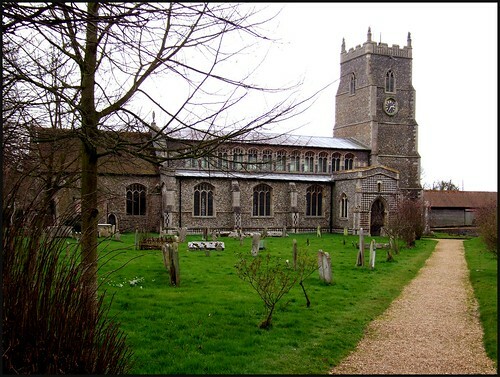 Walsham-le-Willows' most famous treasure, however, is not medieval at all. this is the medallion to a maiden's crants, which hangs from the south arcade. It remembers Mary Boyce, who died of a broken heart on the 15th November 1685. It would have accompanied a flower garland, a symbol of her viriginity. Such things are more common in the West Country than here; perhaps East Anglia did not have so many virgins. The greatest medieval survival at Walsham is the superb roof. It is unusual in that it is supported by alternating tie-beams and hammer-beams, and the original paint is easily visible. It must have been quite something. The contemporary screen also survives, restored and regilded sympathetically. Most of the medieval glass which would have illuminated the roof and the screen has been lost, but fragments have been collected into octagonal lozenges in the east window. The 14th century font which saw all this come and go remains today, set in a sea of Victorian tiles, but still calling the children of the parish to baptism. In the 1950s and 1960s, one of the best-loved stained glass artists of the 20th century lived in this parish, and worshipped in this church. Rosemary Rutherford was the sister of the Rector, and in her studio here she created her familiar swirling, graceful designs which continue to fill naves and chancels with kaleidoscopic light. Some of her best work can be seen at Boxford and Hinderclay in Suffolk, and at Gaywood in Norfolk, but there is a memorial window to her here, on the north side of the chancel. Although it is her design, she did not live to see it completed, dying at a tragically young age in 1972. In her memorial, a simple St Dorothy stands in unashamedly vivid pinks and greens, garlanded with flowers.